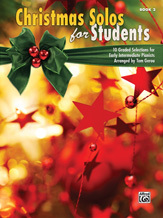 This collection contains 10 holiday favorites that students love. Gerou's fresh-sounding style is sure to bring out the holiday spirit in any student. Book 2 is arranged at the early-intermediate level. Sixteenth notes and triplets have been avoided. Key signatures are limited to one sharp or flat. Chords contain a maximum of three notes in either hand, and simple meters of 4/4 or 3/4 allow for greater accessibility. Titles: Angels We Have Heard on High * Coventry Carol * Deck the Halls * Fum, Fum, Fum * Hark! The Herald Angels Sing * It Came Upon the Midnight Clear * Jolly Old Saint Nicholas * O Come, All Ye Faithful * Up on the Housetop * What Child Is This?